The fun of a few hours on the hunting ground or shooting range is next to none, but over time the noise can wear down on your ears. 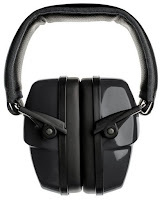 Protect your hearing with the FSL Gunblock Folding Earmuffs, and enjoy your favorite hobby stress-free. Our folding earmuffs are built to withstand the toughest conditions you'll face when hunting---wind, dust, rain and mud. The high quality, durable materials we use in construction are guaranteed to last you through for years to come. No matter your head size, the adjustable cups of the FSL hunting earmuffs slide up and down the headband for a perfect fit. The high quality materials provide a luxurious feel, meaning these remain comfortable for hours at a time. 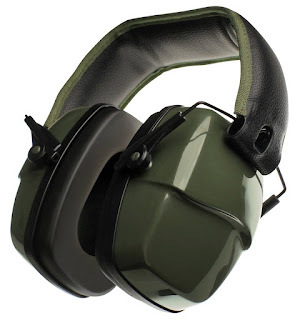 The high NNR/SNR of these shooting earmuffs guarantees the best hearing protection available today. Simply strap these on and enjoy the shooting range, worry-free. These hunting earmuffs fold easily for efficient storage. This increases portability, meaning they won't take up any more space than necessary in your hunting or shooting bag. Unlike most earmuffs for hunting, the FSL ear defenders come in user-friendly packaging that won't take you hours to open. What's more, the packaging is eco-friendly, allowing you to do your part in saving the planet. All of our ear defenders come with a 3 year warranty, as well as our unparalleled FSL lifetime support. I was happy to review these because I want to start learning how to shoot a gun soon. I don't want a gun, but my husband has been bugging me to just know how to use one and I can understand his argument. And, I'm happy to have my own pair of earmuffs so I don't have to rent a pair when I go to the shooting range...(yuk!). Well, the first thing I noticed when this pair arrived was they seemed very well made and durable, good quality. I really like the design too and how they fold up. Making them compact, easy to pack and travel with. When I tried them on, I did notice they're a little tight and I have a small head. I hope that won't be a problem, but I shouldn't be wearing to long to where it might be. The padding around the ears are so comfortable and they really seal out any loud noises. I was surprised because they almost seemed to suction around my hear. Although, I haven't made it to the shooting range yet, I tried to do some testing at home. I'm going to try to explain it. When my husband was talking to me with the earmuffs on, I could still hear him talk, but it's almost like the earmuffs isolated what he was saying and all the background noises were gone. Even when I had him yelling, I could hear him but their was no echo or high pitch that usually goes with it. Overall, I really liked them and the price is really good. I would just be aware if you have a big head, these might not work for you. 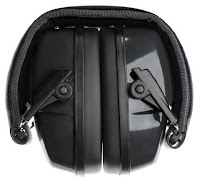 If you would like to try this for yourself, you can purchase these FSL Ear Defenders / Earmuffs For Shooting, Hunting, Drumming, DIY, Motorsport right now from Amazon!